This mountainous course is fun to play with a good challenging layout. You can enjoy playing in beautiful natural surrounding. 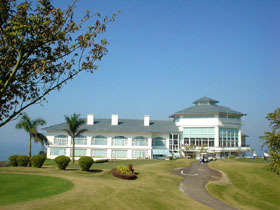 The views of the ocean and the mountain seen from the course are excellent. A downhill par 4 with bushes on both sides. A long hitter can’t use a driver and an accurate FW shot is needed off the tee. The second shot is also demanding because the double-tiered green is small and protected by hazards on both sides. A par 5 with a narrow fairway with an uphill slope on the second & third shots. The closer the green, the narrower the fairway becomes and more fairway bunkers come into play. The green slopes a lot and you risk 3 puts unless your ball is close to the pin. A dogleg to the right requiring a downhill drive over a lake to a tight fairway protected by water on the right. The second shot is also over water and you must hit long rather than short because the front of the green faces water. A short par 3 over a ravine to the sideways double-tiered green. The depth of the green is only 20 yards. A par 5 dogleg to the left with strong uphill second & third shots. This hole is very difficult because the fairway is very tight. You can see the ocean on the right and the view seen from the green is especially wonderful. It takes 2 hours from Hong Kong by bus. It is a 1 hour drive from central Shenzhen. Yellow tees are the longest but no yellow tees are available except for pro tournaments. So, I asked the caddie master to allow me to play from the sides of distance markers where the yellow tees are placed. Holes 1 to 4 on the front 9 are very demanding, so I recommend beginners play from the back 9 first. Some greens are sloped too much with big undulations like the 3-meter ones on the 18th green. Those greens give you definitely 3 putts depending on the pin position. It did not bother me so much because the greens were slow when I played but if the greens are fast, a ball will roll down the sharp slopes off the green on downhill putts. Robin Nelson & Neil Haworth designed courses in Asia are Bali G & CC in Indonesia, Shan Shui (山水) G&CC in Malaysia, Sheshan International (余山國際) GC, Shenzhen (深圳) GC, Jade Dragon Snow Mountain (玉龍雪山) GC which is the highest golf course in Asia, Xili (西麗) G＆CC, Sun Island International (上海太陽島國際) GC, Kunshan Sunisland (昆山太陽島國際) GC, Qingdao Huashan International (青島華山國際) CC, Guangzhou International (広州仙村國際) GC, and Huizhou Tangquan (恵州溫泉) GC in China.